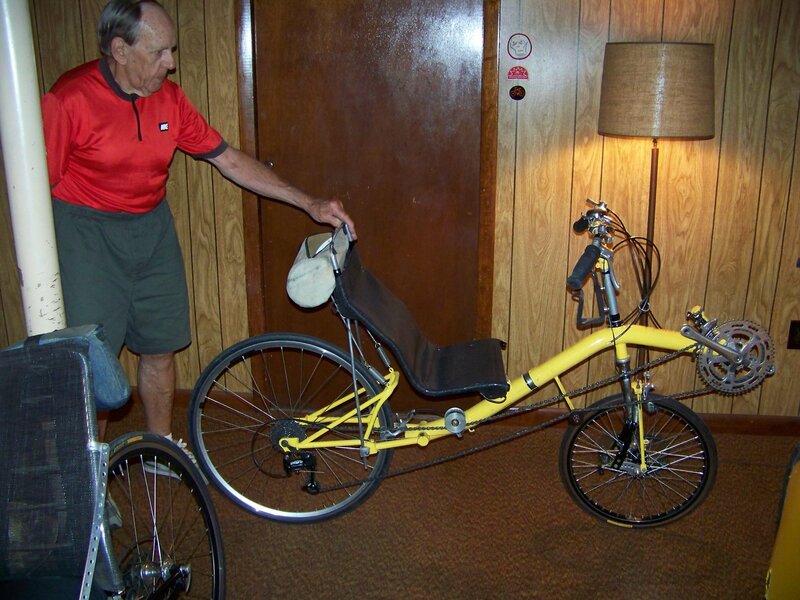 Ralph Koser has built more recumbent cycles than some supposed manufacturers, and at age 81, he's still building them. 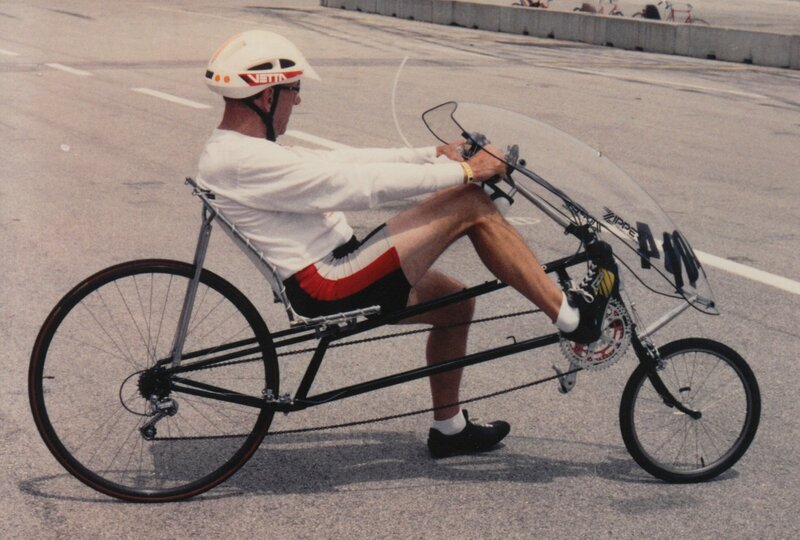 Here's Ralph on his "Amigo" long wheelbase recumbent at the HPV races in July 1994 at the speedway in Milwaukee. It has a wheelbase of approximately 60 inches, weighs 24 pounds (minus ZZipper fairing), has 18 speeds and 700c/17x1.25 wheels. The frame was made of 1-1/8 inch, .028 wall tubing. His speed at the end of the quarter mile was 28 mph. Amigo wasn't just for racing. 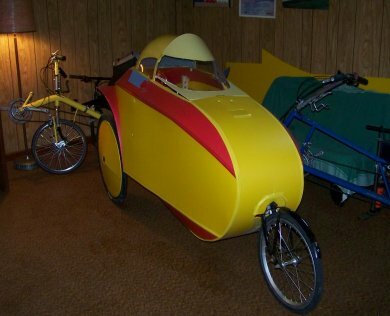 "I ride this bike on the road," he said at the time. Ralph later added rear suspension to "Amigo," which he calls his "best bike." With it, "It just rolls over bumps," he said. Even with rear suspension, the bike weighs only 24 pounds. Ralph holds a short wheelbase recumbent he built with front and rear suspension. 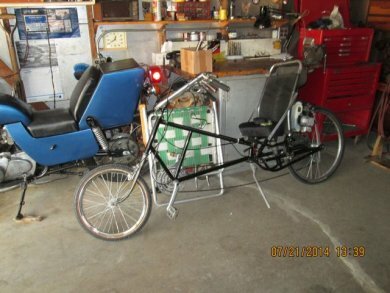 He last built a two-wheeler in 2012, though he still rides them. One reason for his preference for three wheelers, he said, is because it's more of a challenge to build them. 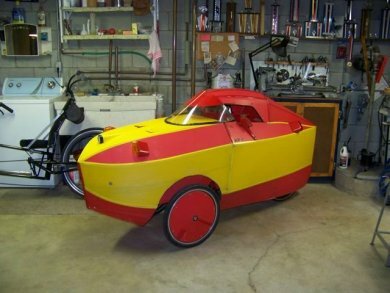 His focus the last few years has been on building velomobiles, some with the two wheels in front and some the reverse. 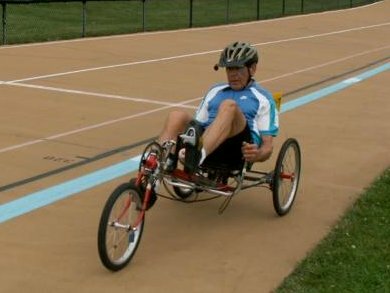 He built his first velo (with two wheels in the rear) in 2000. 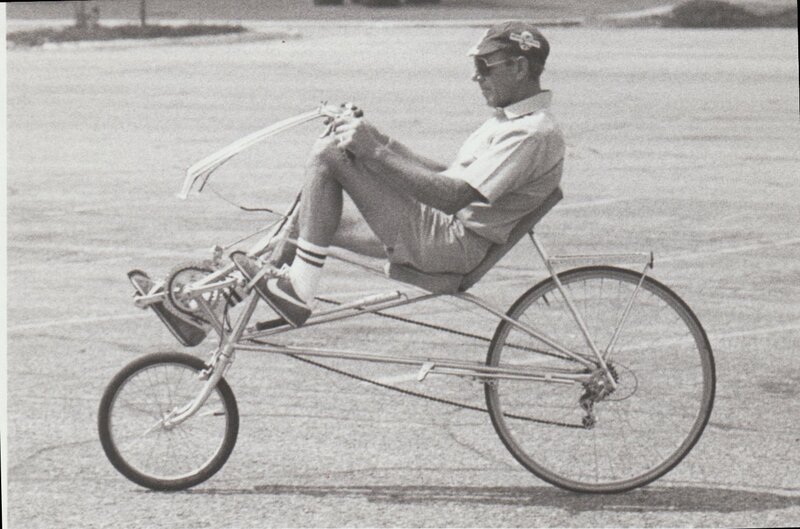 Here's Ralph racing one of his delta trikes in 2008. 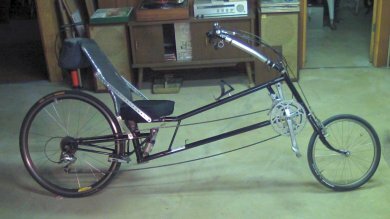 It has under-the-seat steering, mechanical disk brakes on both rear wheels, activated by one lever, triple chainrings and a six-speed freewheel. Rear suspension is provided by a rubber block that fell off a car or truck some where. “Lots of time you find it lying by the road,” he said. “They work good.” Front suspension is via a coil spring. 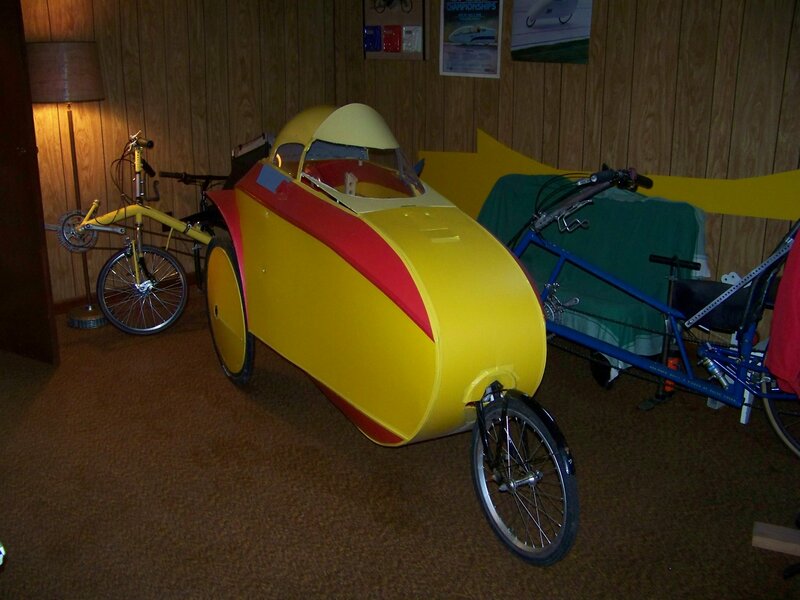 Ralph builds his velomobiles narrow enough so that he can pull them up the stairs from his basement and through the doorway outside (and the reverse). 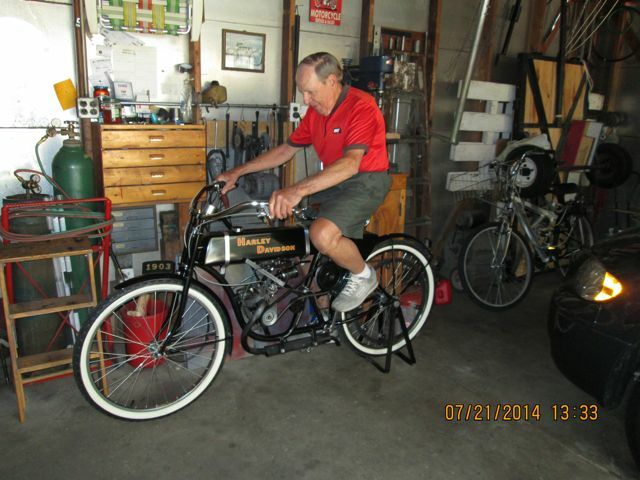 When I visited, Ralph was working on a delta trike with a low seat. 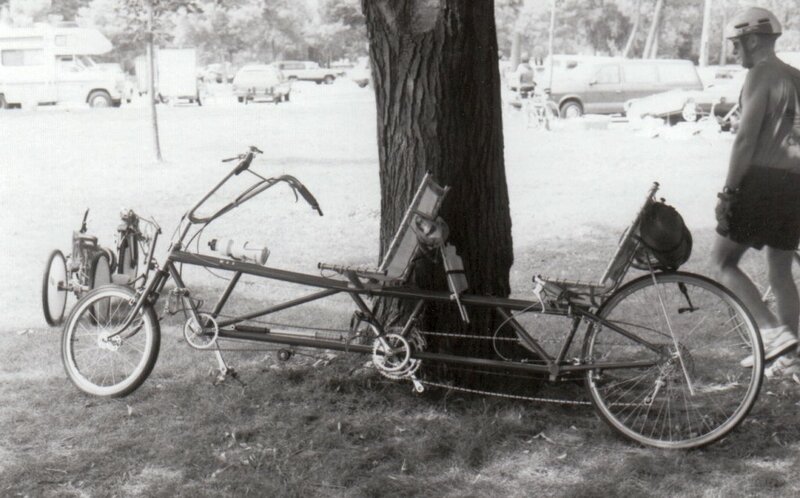 To avoid having to use a crossover drive to the rear drive wheel, or running the chain to a rear axle, he built a crank anchored on both ends, similar in concept to what's used on many pedal boats, rather than using a bottom bracket. A chainring bolts to the left side of the crank, so the chain drives the left rear wheel. There are brakes on both rear wheels. Because of the low seat, he said, “It will outhandle a tadpole any day. It all depends on where you put your weight." The frame shown in this photo was made from conduit, so he could work out the bugs. He then built a frame from 3/4 and 7/8-inch chromoly tubing and rode what he named “Cycle Car” about 500 miles before building a Coroplast body. Both velomobiles have headlights, turn signals and a flashing series of lights in the rear. Which one he rides in winter depends on the weather. It it's just cold, he rides the tadpole (two wheels in front). But if there's snow and slop, he rides the delta because it stays clean inside and the chain stays clean. That's because the single front wheel (with fender) is outside the body and the chain doesn't run alongside a wheel. The tadpole's wheels are inside the body and, of course, the chain runs to, thus alongside, the rear wheel. 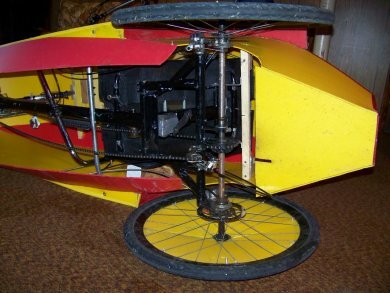 Ralph also built a delta trike (no body) powered by a 4-stroke 25cc engine that came from a leaf blower. A roller friction drive powers the left rear tire. “It goes along at 15-16 (mph) real nice,” with top speed a little over 20 mph. 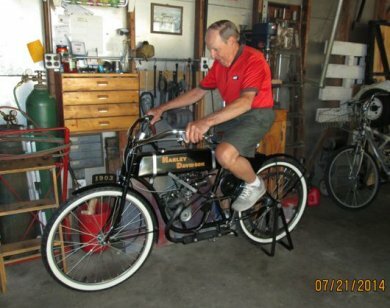 Ralph built this replica of a 1903 Harley-Davidson about 10 years ago, powered by a Tecumseh snow blower engine, "probably 3 horsepower." The gas tank was made from a sign. Top speed is about 30 mph. Part of the reason for the light weight of his creations is his preference for thin wall chromoly tubing, for instance, .035 wall. “I braze everything,” he said. “It's not as strong as welding, but it's strong enough.” And if anything isn't quite right, the brazing can be melted and redone. This long wheelbase recumbent has rear suspension and a small gasoline engine. The blue vehicle behind it is a 1980 Kawasaki with 440cc engine that Ralph converted into a "feet forward" motorcycle by moving the rear suspension pivots about 6 inches rearward and building a lower seat, with luggage compartment behind it. 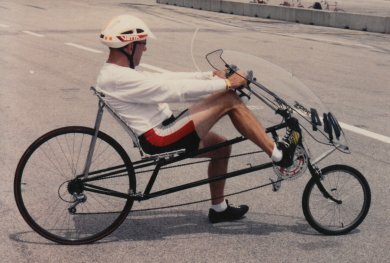 In this picture Ralph races his micro open cockpit FWD lowracer streamliner in 2000 at the Northbrook, IL velodrome. He built this bike to fit in the back of his Cavlier station wagon. 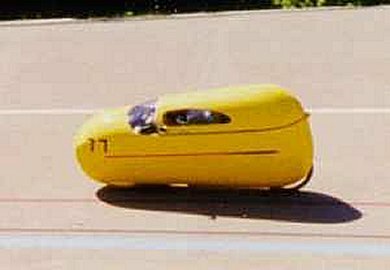 Ralph's fully faired mini-rocket at the Kenosha Velodrome in 1998. After racing this bike he said that the open cockpit version was faster for him. Ralph has built at least two tandems. 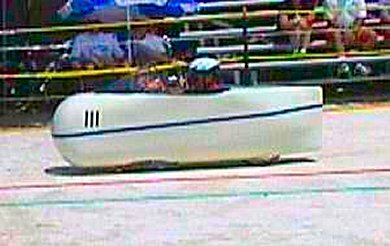 This one was photographed in 1991, at the HPV races in Milwaukee. This was the seventh recumbent Ralph built, photographed at the third annual Midwest (now Michigan) Human Powered Vehicle Rally in 1985 in Battle Creek, Mich.
Because of liability concerns, Ralph does not build bikes or trikes for others, nor does he sell cycles that he no longer rides. Which makes his basement and garage a fascinating museum of his creations. He does a lot of riding – 1,960 miles as of Dec. 10, 2014 – with his goal for the year being 2,000 miles. Photos from Mike Eliasohn, Ralph Koser and the recumbents.com site.